Tens of thousands of Armenians on Wednesday converged on the capital, blocking roads and government buildings, as popular anger exploded over the ruling party’s rejection of opposition leader Nikol Pashinyan’s premiership bid. In an unprecedented show of defiance, protesters including many elderly people and housewives paralysed Yerevan, with nearly all streets closed to traffic and many stores shut, AFP correspondents reported. Officials said that suburban train services were disrupted and the road linking Yerevan with its airport was blocked. Crowds of protesters across the city waved national flags, blew vuvuzelas and shouted “Free, independent Armenia!”. “Dear ones, metro and railroads have now been paralysed, the road to the airport has been shut down,” Pashinyan told his supporters, adding that a number of universities and schools have joined the protest movement. Protesters said they will stay on the streets for as long as it takes to oust the ruling elites from power and get Pashinyan elected prime minister. “The people will not give up, protests will not subside,” Sergey Konsulyan, a 45-year-old businessman, told AFP. 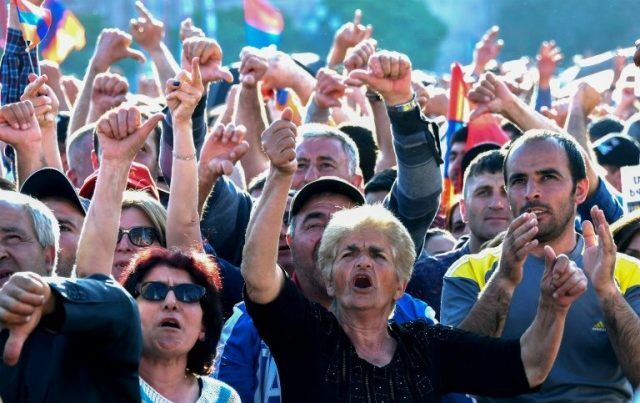 Pashinyan urged Armenians to launch a general strike after the ruling Republican Party on Tuesday shot down his bid for premier following two weeks of anti-government protests that ousted veteran leader Serzh Sarkisian.